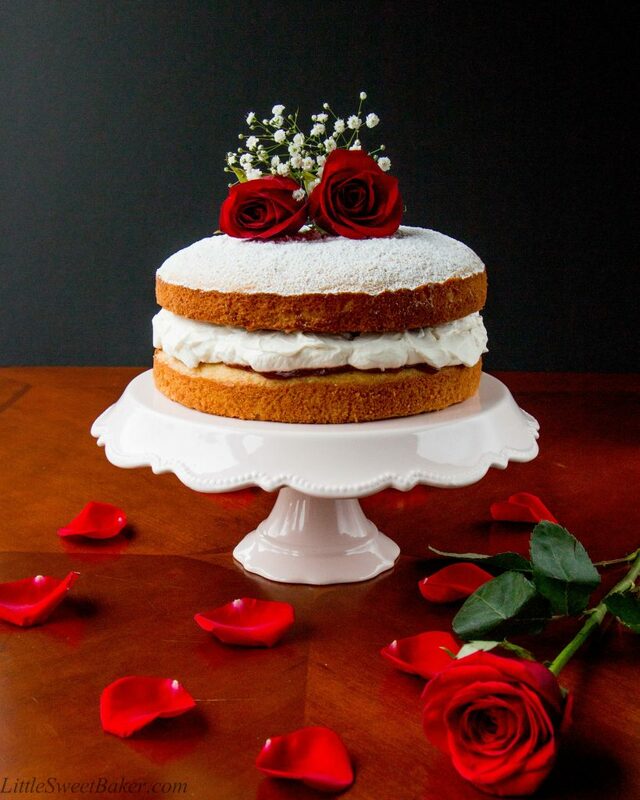 This is a British-style sponge cake layered with raspberry jam and whipped cream in between. This version is jazzed up with the addition of fresh raspberries in the filling. 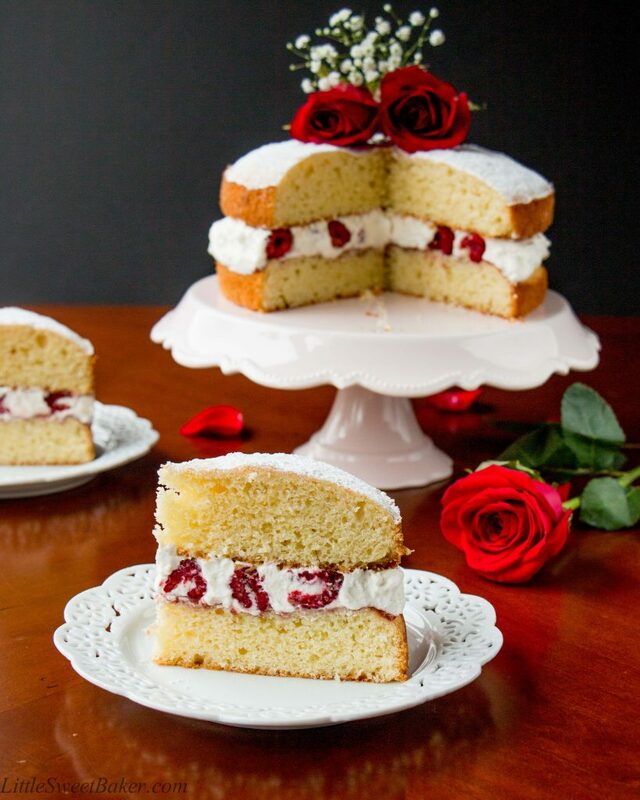 Victoria Sponge Cake was named after Queen Victoria during the mid 18th century. It was one of her favorite cakes and was often served during her teatime with her lady friends. So with Victoria Day coming up, I thought this cake would be fitting to celebrate with. 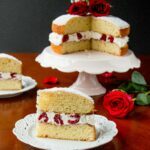 I was originally going to make traditional Victoria Sponge Cake with raspberry jam and whipped cream, but I was swayed when I saw Jamie Oliver’s version with fresh raspberries. I just love the pops of red in the filling and the extra flavor the fresh fruit brings to the cake. 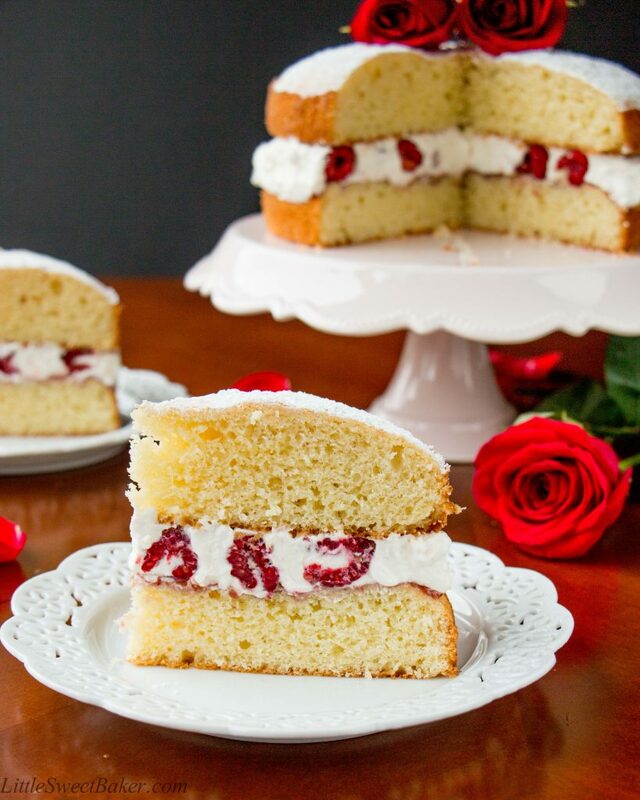 This recipe starts with your classic British-style sponge cake. 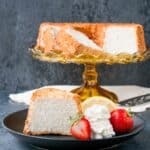 It’s similar to an American pound cake, but it’s lighter and more tender with the addition of baking powder. In between, there is a layer of raspberry jam, fresh raspberries and sweetened whipped cream. The texture of the cake is soft and spongy, hence the name. 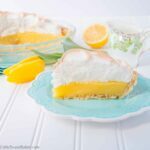 The taste is mild and buttery with a creamy and sweet filling. The fresh raspberries add a burst of vibrance and an extra layer of flavor to this simple, yet elegant dessert. Preheat oven to 350F. Butter two 8″ round baking pans and line the bottoms with parchment paper. In a small bowl, toss together the flour, baking powder and salt. Set aside. Using an electric mixer or stand mixer with paddle attachment, cream the butter and sugar for 3-4 minutes until pale and fluffy. Add in the eggs, one at a time and mixing well in between. With the mixer on low, stir in half of the flour mixture. Add in the milk and mix for a few seconds to loosen up the batter, then stir in the rest of the flour until just combined. Divide the batter between the prepared pan. Spread and smooth out the surface. Bake for 25 minutes or until tops are lightly browned and springs back when gently pressed. Let cool completely before assembling. Meanwhile, whip the heavy cream, sugar and vanilla until soft to medium peaks form. Once cake is completely cooled, trim the dome of one of the cakes if needed, then spread the jam, followed by half of the whipped cream. Scatter with raspberries and spread the rest of the cream on top. Layer with the second cake, press down gently and dust with powdered sugar. Slice and serve with a nice cup of tea. Leftover cake can be stored wrapped up in the fridge for 2 days. Recipe adapted from Globe Table Adventure and Jamie Oliver. I’ll be sharing this at Fiesta Friday #172 hosted by Angie, co-hosted by Jhuls@TheNotSoCreativeCook and Su@Su’sHealthyLiving. I love that it isn’t too sweet! Super yummy! I made this cake and it baked perfectly and was light, even and spongy. Great recipe. Hmmm, by looking at this beautiful cake, I am feeling Valentine’s Day is happening soon!😍 This looks so gorgeous and delicious! I am having a slice right now. Thanks for taking this along with you at Fiesta Friday party this week, Lily. I wish you a lovely weekend! A proper Victoria sponge is on my Baking Bucket List. Hopefully mine turns out as lovely as yours did, Lily. Great job.